Philadelphia Eagles defensive end Chris Long during a press conference at Mall of America. 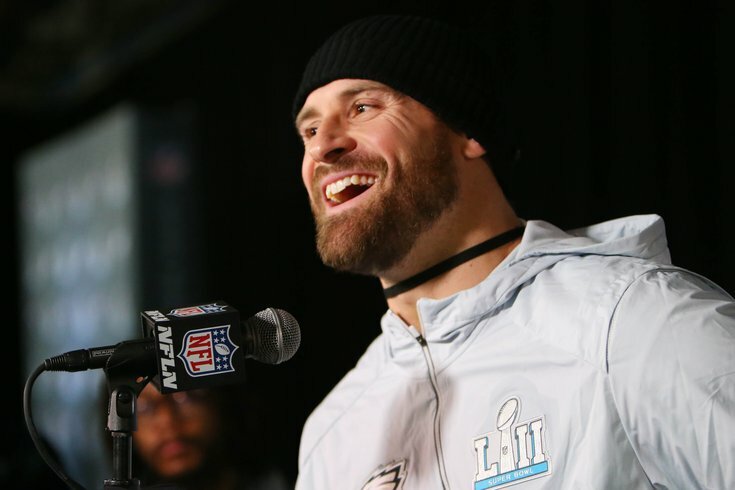 Chris Long was not happy when Fox News host Laura Ingraham took a shot at LeBron James' intelligence on the air Thursday night after the NBA superstar criticized President Donald Trump on an ESPN podcast this week. And as the outspoken Philadelphia Eagles defensive end and two-time Super Bowl winner often does, Long called foul on Twitter. James and Golden State Warriors forward Kevin Durant weighed in on the president during a pre-recorded conversation with ESPN's Cari Champion in January. "The No. 1 job in America, the point person, is someone who doesn't understand the people, and really don't give a f**k about the people," James said in the video. Calling the comments "barely intelligible" and "ungrammatical," Ingraham advised James to just "shut up and dribble." "I’m numb to this commentary – like. Must they run their mouths like that?" Ingraham said on her show. "Look, there might be a cautionary lesson in LeBron for kids. This is what happens when you attempt to leave high school a year early to join the NBA. And it's always unwise to seek political advice from someone who gets paid a hundred million dollars a year to bounce a ball." So, he treated the network and his followers to a montage of Fox News "allowing political commentary from a few folks." First, he gave a shoutout to musician Kid Rock, legendary college basketball coach Bob Knight and ANACONDA GUY seasoned actor Jon Voight. Then came Clint Eastwood, Chuck Norris and Ted Nugent. Some Twitter users then followed suit with a few more gems. Ingraham released a statement through the network on Friday, saying she's made similar remarks in the past about other entertainers and sports figures, including late-night host Jimmy Kimmel and San Antonio Spurs head coach Gregg Popovich. "If pro athletes and entertainers want to freelance as political pundits, then they should not be surprised when they’re called out for insulting politicians," the statement read in part. "There was no racial intent in my remarks – false, defamatory charges of racism are a transparent attempt to immunize entertainment and sports elites from scrutiny and criticism."